Most people know by now I had to get a new iPhone because my old iPhone got wet during an unexpected dip in the Pacific Ocean last month. And they've seen the scars on my feet and legs from my unexpected dip as well. What I haven't told anyone is exactly what happened. I needed some time to process it all myself first. 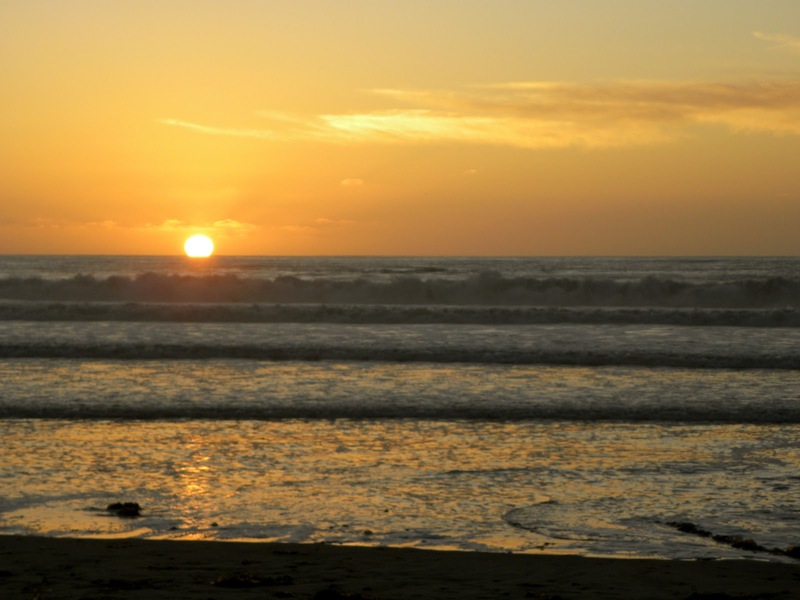 It involves an energy worker, a crazy lady talking to herself on the beach, and a cleansing. I had just spent the past few days at the yoga training I was at last year right before my mom died. Many of my same yoga friends were there and they remembered how worried I was about getting home in time to spend time with my mom. They were very compassionate as they asked how my year without her had been. I also got to spend lots of time with a good friend of mine that I hadn't seen since she suddenly lost her husband. Although we laughed and had a good time, we also took some time to share our grief. In fact, we actually scheduled Reiki sessions for ourselves with a Reiki master-in-training that was in our group. During my session, my Reiki healer told me my sixth and seventh chakras are very open and it's obvious I've done a lot of internal work on myself lately and I'm very open to a spiritual direction. Agreed. She also said my fourth chakra, my heart chakra, was in conflict. I was holding on to a lot of old grief and hurt. I also was intentionally closing my heart off for fear of being hurt in the future. Agreed again. It was a fabulous session where I did some crying, some laughing and lots of listening to my intuitive new friend. She left me with lots to think about. Fast forward to the last day of the training. I had been invited to go out with some of the other women after class and before we all made our way to the airport. I passed on the offer because I wanted one last chance to walk the beach. As I walked the sand at sunset by myself I enjoyed the peace and quiet. I gathered shells to bring home for the kids, called home and assured everyone I would be home soon, and then sat to watch the sun go down. The lower the sun got the harder it became to hold back the tears. Don't sit here and look like a crazy woman crying on the beach, I told myself. So I started walking. And the more I walked the more I cried and the more I cried the more I talked to God. Like out loud talk to God. So now I was a crazy crying woman walking the beach. I've been accused a few times over the past few years of turning my back on God. I hadn't turned my back on Him, I was just a little pissed off at Him. I honestly don't remember the last time I talked to God, or even really gave Him much acknowledgement. The more I talked the more came out. How dare you give my mom cancer? Why would you be so mean and take her when she was so young? And I'm still really mad she hasn't visited me this year. I want a sign from my mom and I want it right now. So come on, do something! You are unfair and uncaring. And I'm done with it all. I'm not begging anymore for anyones love and attention. I'm tired of waiting for someone to say it. I give up. I surrender. Love me or not. And don't you dare mess with my kids. I've done everything I'm supposed to do now You step up and do something. What about what I want? Oh yeah, and if it's all in Your hands, well then let's go. I'm writing a book so let's make it happen. What do You think of that? Come on, where's my sign you are there? Well? Oh god, I really am a crazy person. And then I started laughing. And laughing. And laughing so hard I didn't see the big wave that was coming right for me. As I felt the water hit my feet, my knees, my waist I realized I was going down. I tried to climb up onto a rock to get out but my feet slipped and I actually fell down deeper. Only my head and one hand trying to keep the camera dry were above the water. I should have been scared. There was potential here for the situation to go bad. But I was calm. Very calm. I was kind of enjoying the dip into the cold water even though I was in my yoga clothes with my purse slung over my shoulders ( in effect weighing me down further). I was confident this was going to end OK so I had enough sense to just go with the direction the water was taking me, eventually landing on my feet. And land on my feet I did. In fact it was my heavy purse, now even heavier with water and seaweed, that snapped me back to reality. My phone! My wallet! Everything was in tact, just very wet. I didn't even realize my feet and legs were bleeding at first. I found another solitary beach walker who let me use her cellphone for a ride back to the hotel. I changed into dry clothes, the front desk staff found bandages for my feet and let me use the hotel phone to call home to let everyone know I'd be travelling all night without a phone. I was exhausted but felt... good. Felt better. Felt like I finally believed it really was going to all be OK. 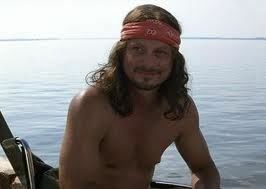 Looking back now I consider it my Lt. Dan moment. My time to stand in the storm and challenge God. My time to make peace with everything. I feel more relaxed about everything since I've been home. I feel more confident, more content and more at peace. Today marks the one year anniversary of my mom's death. It's been one hell of a year with lots of bad stuff and lots of amazing stuff too. Many times I've picked up the phone to call her before realizing I can't do that anymore. I don't think getting dunked into the water was a sign from my mom. Although it is something my mom would do. I believe my fall into the water was a form of baptism. A cleansing to wash away all the old crap and placing me back on the sand a new person. Refreshed, renewed and re-energized. And a reconfirmed faith that it's all going to be OK.
Great post! Those anniversaries can be hard, miss you, hopefully we get to see each other this year. What a beautiful post. I lost my Mom 11 1/2 years ago. I miss her so much and think of her every single day. I'm sure you will get a sign from her.